I’m into the idea of saunas right now. I’m not sure if it’s because the NYT told me that they’ll be good for blood pressure or because I’m chronically cold, so the idea of being surrounded by hot salt is extremely appealing, or what. The persistent dreary weather is contributing for sure. I don’t go all that often, though, despite passing by the steam room at the gym constantly. Due to these and more questions, I have been settling for my at-home sauna, which is… making pho broth and placing my face over the gingery scented steam. Yum. Omitting meat from pho definitely changes the taste; this recipe won’t imitate the taste of beef or chicken. It’s much more ginger-forward and spicy instead of savory. It’s a lot faster to make and feels lighter. Compared to restaurant pho, this pho is much less salty, and the flavor of the spices comes through more. If I’ve got leftover chicken from something, I usually make a broth and then sub the broth for the water in this broth… also quite good. Preheat your oven to 400˚F. Rub a bit of vegetable oil on a small baking sheet. Quarter the onions and slice the ginger, arranging on the baking sheet. Char in the oven for 20-30 minutes, until the tips of the onion are charred and the vegetables are soft. Boil onion, ginger, spices (you can use a tea strainer to keep the spices tidy), salt, and sugar in the water for at least 30 minutes, adjusting salt as needed. Add the fish sauce to taste after. While the broth is boiling, parboil your noodles and green vegetables. I usually do this by arranging the noodles in a bowl and pouring hot (not boiling) water over them and letting them sit until “al dente.” For the vegetables, blanch them by submerging in boiling water for a few minutes (until bright green) and then immediately removing. Run cold water over the vegetables to stop the cooking. 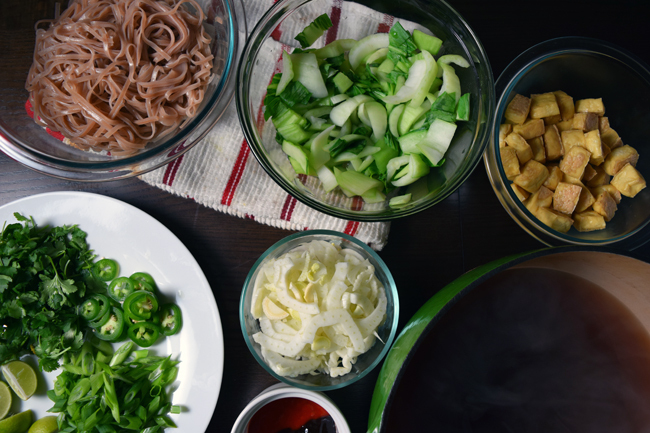 When the broth is ready and all your toppings are prepared, assemble your bowls. Add a small bundle of noodles, vegetables and tofu to taste, and pour very hot broth over the bowl. Top with cilantro, green onions, jalepeno, and a squeeze of lime. Serve with hoisin sauce, Sriracha.